Las Cruces Real Estate is the only company in town who has hired Curaytor, a renowned national marketing company to help promote our listings with the best digital marketing. We are able to achieve maximum exposure for your property, thereby generating the best offer in the least amount of time! If you are interested in having nuclear marketing like ours, contact us today! 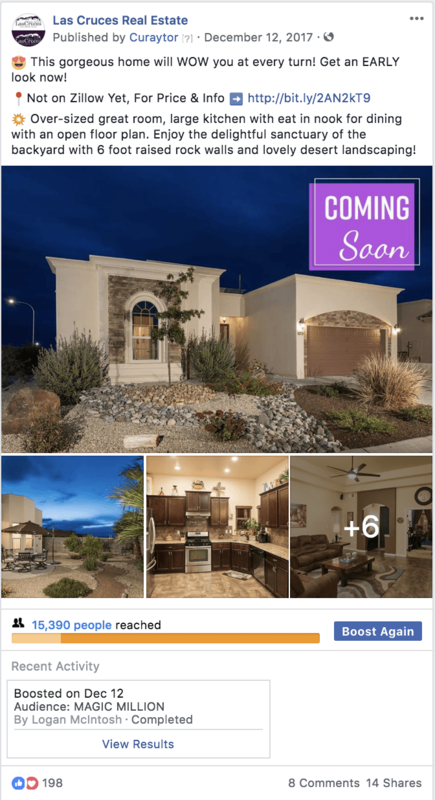 Las Cruces Real Estate invests heavily in our listings (professional photography, drone shots, sturdy post sign, Facebook ads, web blasts, glossy flyers, admin costs, etc.) and most of the expense is incurred up-front. We will create and promote a Coming Soon/Pre MLS Facebook Ad Campaign. "Coming Soon" listings create curiosity! We install a sign and advertise a few key features online, but the details are hidden until the listing goes live. In today's world of instant information, this creates a sense of curiosity and urgency, generating a great deal of interest, before the property is even listed! Here is an example of our Just Listed ad. Look at that reach! Over 32,000 people have seen this ad! We will create and promote personalized Email Blasts which will feature your listing in email campaigns sent weekly to our 11,000+ person database. Pricing is the seller's decision, with enough information provided by the real estate expert. Aggressively pricing from the jump will maximize seller proceeds, especially if the property is vacant. Paying utilities, maintenance and often a mortgage, on an empty house, will drain equity quickly. 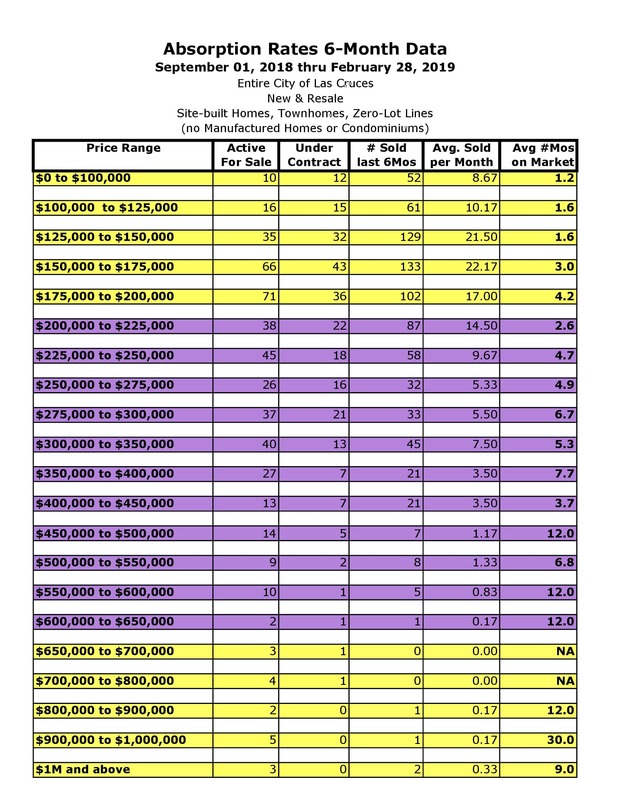 Use a unique Competitive Market Analysis (CMA) from your real estate expert and Absorption Rates to determine your property's market Sweet Spot. Please find below the 6-month Absorption Rates for the City of Las Cruces. This shows the average length of time to sell, by price range, in the last 6 months. This is a great tool for understanding the Las Cruces market as a whole. Ready to Love Your Listing? If you have any questions at all feel free to contact us. We are happy to help! With this plan installed we will make sure your property gets the maximum amount of exposure. In this digital world, technology is the most important component for getting exponential reach for your property listing. Let us help you get it SOLD! Also, please check out our BLOG! Contact Las Cruces' #1 Digital Marketing Firm!